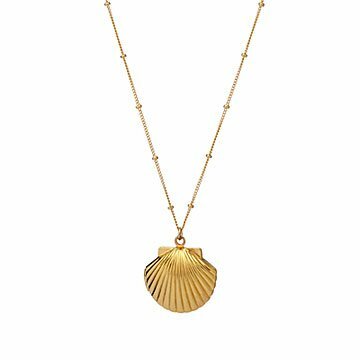 Amanda Eddy’s 14-karat gold-filled seashell locket lets you carry tiny treasures wherever you go. Soft sand, fresh air, and cool waves splashing your toes. There's a reason we call having a good time "a day at the beach." Amanda Eddy's handmade seashell locket captures a bit of that fun-loving feeling—and your tiny treasures. Whether you fill it with a photo, a note to yourself, or even found pebbles from your last walk on the coast, it's a pretty way to keep your special memories close. And, since the shell and 30-inch chain are 14-karat gold-filled, its glow is even more radiant than your last suntan. Handmade in Austin, Texas. In 2009 Amanda Deer Jewelry started from a simple idea that arose from one little problem: where was all of the affordable, dainty jewelry? Amanda was on the hunt for something simple, delicate and within her budget, but the only pieces she found were well over $300. She decided to take it upon herself to create simple, dainty jewelry she could wear everyday at a great price. After rave reviews from friends and family, Amanda threw a few of the pieces she made online, not expecting anything, but people took notice. While working a full-time job in marketing, she slowly grew her jewelry business on the side, and things started to take off. Unable to keep up with the demand, she quit her day job and hired a team of creative ladies to help her make, design and grow the jewelry line. Since then, she’s been able to share her jewelry with customers around the world and opened her first flagship store in Austin, Texas in 2017. The space doubles as a maker studio in the back with a jewelry showroom in the front where customers can explore new designs in person. Pendant: 7/8" L x 3/4" W Chain: 30"